Kailash Mansarovar Yatra – Summit Helicopters Pvt. 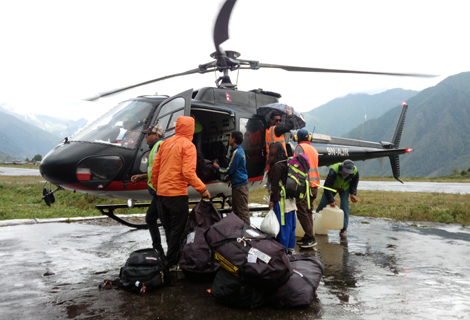 Ltd.
Fishtail Air is now operating one of its B3 helicopter in Far western region of Nepal called Simikot. Simikot is the gateway to Mount Kailash and Mansarovar Lake. Fishtail is operating since May 27 and has done more than 250 shuttles up to now and sending more than 1000 passengers up to Hilsa (Nepal Border) and along with that, we have done emergency rescue evacuation from Hilsa to Simikot and Simikot to Nepalgunj as well as Kathmandu. Fishtail will be operating up to September of this year and we have named for this mission as “HILSA MISSION“.